You will love this women’s mini dress! 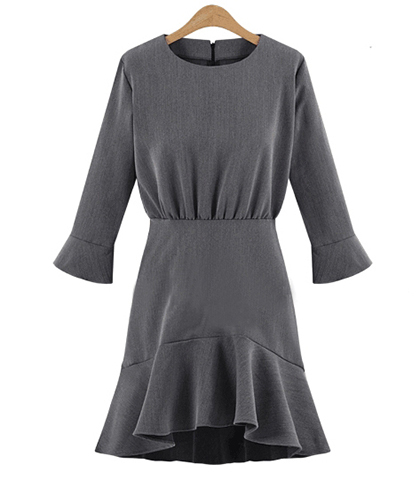 It comes with a cleverly-designed mermaid ruffle at the asymmetrical hemline that gives it a definitive look that will make you stand out in a crowd. The dress comes in three lovely color choices. Select your favorite from Red, Black or Gray. The bodice is gathered at the waistline and has a rounded neckline. The sleeves are three quarter length. Small, circular ruffles appear at the cuffs. This dress zips in back with a long, concealed zipper. It is machine washable and can be tumbled dry. It is available for purchase in sizes Medium or Large.